Took a quick look around Dunedin again the other day. Haven’t been there for a while. One of the good things about Dunedin is that it doesn’t change too much. Sort of like a comfortable old sweater. 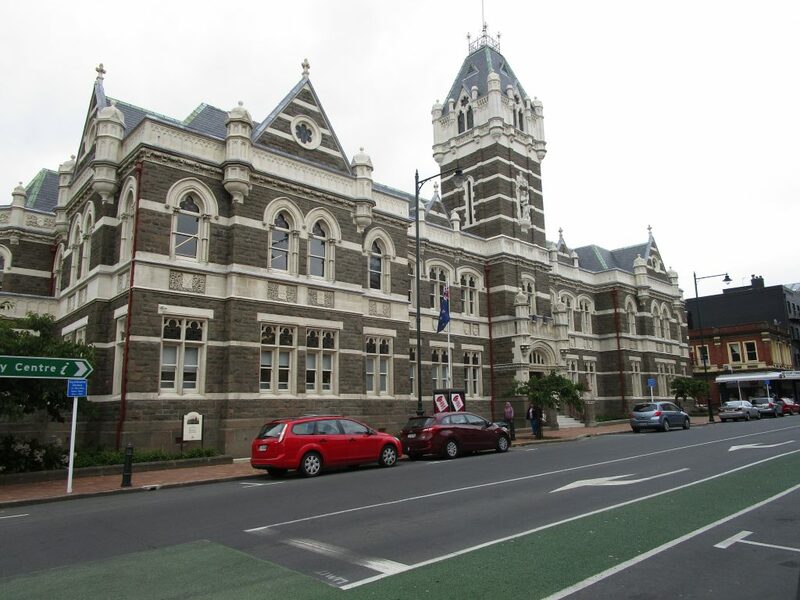 If Dunedin has anything to give the nation it is the heritage of its beautiful buildings. They survived the barbarity of redevelopment because nobody wanted to redevelop Dunedin. As a result we have a treasure trove of Victorian architecture. But first things first. The airport is about 27km out of the city, so not an easy transit problem. I took the simple solution . . . hired a rental car. From Ace Rentals it was only $65 for a day’s hire, an impost I considered most reasonable because it gave me full movement options. Must admit it was a bit weird. The pick-up instructions were to go to the Hertz counter in the airport. Eh? To get an Ace car I go to Hertz? Yep. That’s how they roll down there. Makes a lot of sense in a way. Sure, Hertz is helping a competitor, but I imagine they are well rewarded which keeps their standing costs down. Either way, it went well. The lass at the Hertz desk got me signed, sealed and instructed on where to find my car. Into the city is a breeze. They have, wait for it, a motorway! God knows why. There aren’t that many cars. But, hey, who am I to blow against the wind, as Paul Simon said. It made the trip so easy. Checked into my overnight accom at Wains Hotel. It’s one of the earliest hotels in the city but now totally refurbed to a high standard. 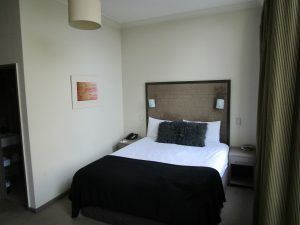 Not large rooms but perfectly adequate and at $NZ140 a night, very good value, especially as it’s right in the middle of town. Next day I wanted to head out to Taiaroa Head to see the albatross colony. It’s the only place in the world where you can see these magnificent flying machines on a mainland location. Anywhere else it is an uncomfortable and expensive boat ride. Here, it’s a 45 minute trip and you are there. But a road trip on the Otago Peninsular has a heapin’ helpin’ of a hellava lot more than just that. Did I say first things first? Then let’s deal with the city before we go a’wandering. “The Edinburgh of the South”. The finest Victorian city, according to the locals, in the Southern Hemisphere. Whatever else it might be, Dunedin is one of our too-often overlooked travel gems. If you can convince the average tourist to go there at all, they usually make Dunedin an overnight stop on the road from Milford Sound to their return flight out of Christchurch – an alternative to “been-there-done-that-bought-the-T-shirt” Queenstown and the road through the centre of the South Island. On a busy travel schedule you can only afford to stop for the things that are unique, different, important. How unique do you want? This is the only place in the world where you can take a short drive to see an albatross colony. How different? Here’s a city – built by men of power and property at the height of their gold-rush affluence – that has never been upgraded with a bulldozer, its 19th-century architectural heritage preserved by fickle prosperity. How important? If you are into “green tourism” how important is the nesting site of the world’s oldest and rarest penguin species, the yellow-eyed penguin, whose numbers dwindle each year, crunched by the impact of habitat changes, introduced predators and lately a particularly devastating viral plague. Or, if you are into trains, how important is it to take a ride on a restored Victorian railway masterpiece, along tracks driven by Scottish engineering skill through some of the most rugged and spectacular scenery in the region? The pub, the European, is long gone – replaced by a phalanx of pubs and restaurants – but the church is worth a look especially because of the way in which early and modern design has been seamlessly melded. The original structure was started during World War 1 but the final addition, the chancel, wasn’t built until 1971. It’s the stone-vaulted roof in the nave that’s worth seeing – the only one of its kind in the country. Walk on past Burns and down the street towards the Railway Station. On the right are the Law Courts, designed and built in 1899. Notice the statue of Justice above the doorway – she has no blindfold and is believed to be only one of three in the world where Justice is not blind. People are often amazed when I suggest that they make a special visit to the railway station. Built when railways were at the height of their commercial and technological power, the Dunedin station is a celebration of the confidence and certainty of its masters. Dunedin Railway Station. A paroxysm of Victorian design excess. Interior of Dunedin Railway Station. When the then Prime Minister, Joseph Ward, laid the foundation stone there was no doubt that railways were the transport marvel of the age. Little did anyone in the crowd know that just north a ways, at Temuka, Richard Pearse’s home-built aeroplane had already made a hop skip and a jump to create a technology that would put an end to the transport primacy of steel wheels on steel rails. There are still those who believe he beat the famous Wright Brothers into the age of powered flight. The station is a paroxysm of Victorian design excesses. Little wonder that they christened George Tripp, the designer of the place, Gingerbread George. To your left as you leave the Railway Station, on the other side of the street next to the Law Courts is the police station. Like the Law Courts it was the work of John Campbell, whose design was heavily influenced by the English architect, Norman Shaw, the man responsible for London’s New Scotland Yard. Totally symmetrical, it was a reaction against the excesses of Victorian stylism – of which the railway station is a glowing example. Unfortunately the building lost its chimneys in 1933 and with it lost some of its architectural balance. 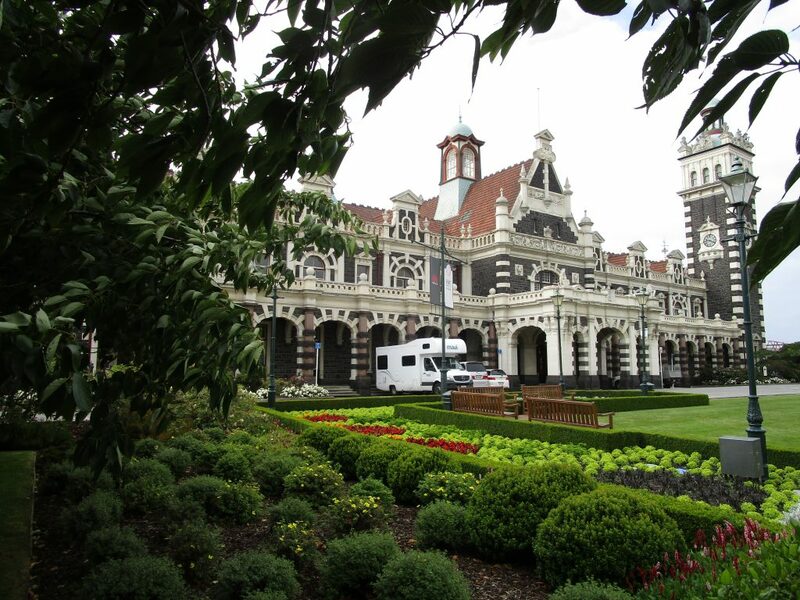 Next to it is the Dunedin Prison, a rare international example of a purpose built Victorian courtyard style prison. Built in 1895-98 it was still in use as the local pokey until 2007. It’s a Grade 1 listed heritage building. You can take a tour on a Saturday morning. Learn more from the Dunedin Prison website. Just along the road from the Railway Station on the same side, is the Otago Settlers Museum. Head that way and note the kerosene lamp standard outside. It’s the sole survivor of the 53 lamps that lit the city’s main street in 1863. 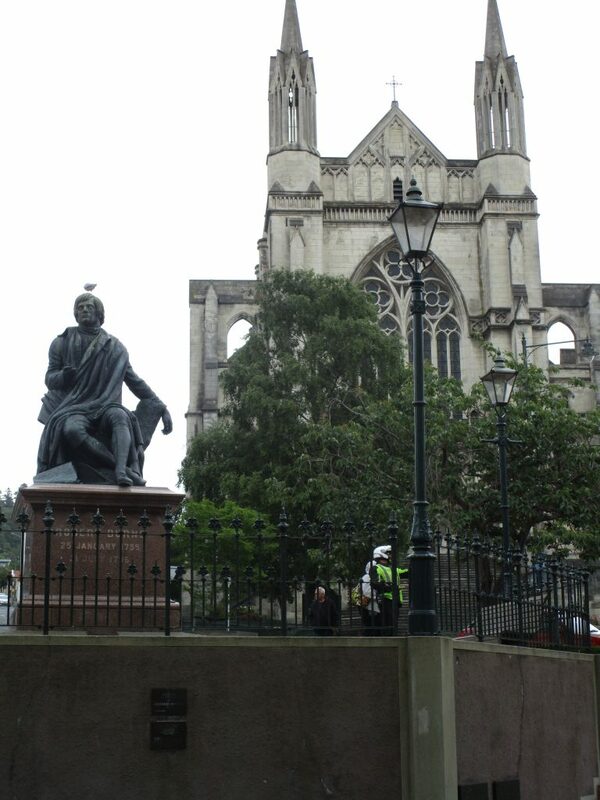 Dunedin was the first city in NZ, and among the first in the world, to use kerosene street lighting. The engineer, John Millar, was so proud of his lamp stand design that he had his name embossed boldly on each of them – and if you have a look on the base, there it is, “Millar, City Engineer”. Man proud of his work. Otago Settlers’ Museum 31 Queens Gardens. The doors of this exceptionally fine local museum first opened in 1908, the 60th anniversary of the founding of Dunedin city and the Otago province. It traces the lives of the settlers – indigenous Maori, the early Chinese, and following waves of migrant groups – and their technological innovation, art, fashion, domestic life and transport. 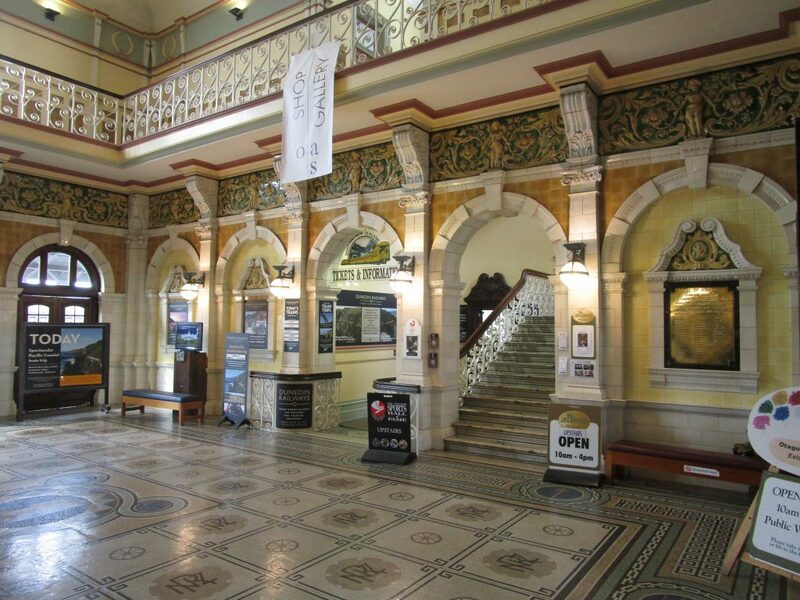 It is housed in the original Edwardian galleries and Dunedin’s former New Zealand Rail Road Transport Building, but now with a very modern entrance foyer. On the way there have a look at a railway engine. JA 1274 was one of the mighty steam locos used on the main trunk line that linked Invercargill to Christchurch. It was built at the vast Dunedin Railway Workshops and in 1971 when it finished its days as a working locomotive, was given by the then Minister of Railways, as a reminder of the long association between Dunedin and the Railway Workshops here which built much of the engines and rolling stock in the days of steam trains. Next to the Settlers’ is the Chinese Garden. Dunedin has a long history of Chinese settlers. They came in the 19th century for the gold fields of Otago, but many stayed on and became highly successful business people. 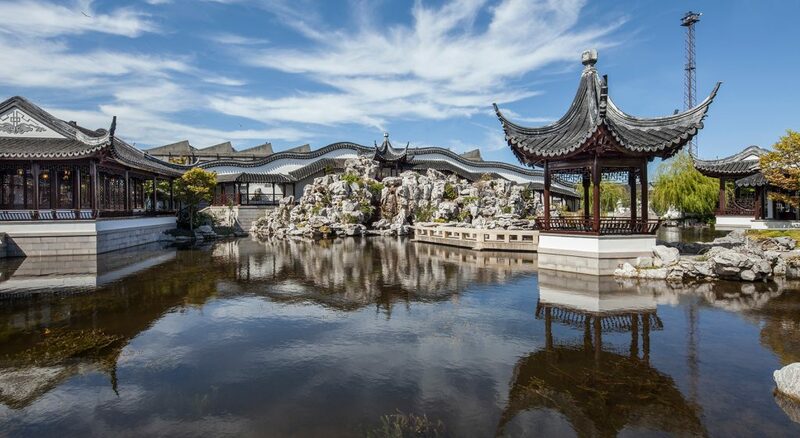 The Chinese Garden, a perfect miniature of a traditional Chinese painting, celebrates that Chinese heritage. It is an oasis of peace and quiet amid the bustle of a city. “Most cherished in this mundane world is a place without traffic, truly in the midst of a city there can be mountain and forest.” Wen Zhengming (1470 – 1559). Five hundred years ago old Wen was right on. Otago Museum 419 Great King St. As Otago rode high on the floodtide of gold streaming out from the hinterland valleys, the directors of the newly-founded Otago Museum were able to indulge their passion for collecting. The Melanesian and Polynesian halls – the Pacific Collections – are amongst the finest in the world. And in the Maritime Hall the big item – literally – is the skeleton on a blue whale. You can take expert guided tours of the various sections of the museum. Good cafe on site, too. Probably one of the more unusual museums (should that be musea?) is the Dunedin Gaswork Museum 20 Braemar St, South Dunedin. Situated in the Engine House of the now closed Dunedin Gasworks which was New Zealand’s first and last gasworks, operating from 1863 until 1987. It is one of only three known preserved gasworks museums in the world. This is a significant local and world heritage site. Sir Neil Cossons, former chairman of English Heritage and a world authority on industrial heritage, stated that in his opinion this museum has “the best examples of an operating gasworks plant in the world”. Open every Sunday, 12:00 noon to 4:00pm. Speights Brewery Tour 200 Rattray St Ph 03-467-7697 Email tours@speights.co.nz. Fancy a pint? Or more accurately an insight into the brewing of that pint – take the Speights Brewery tour which traces the history of brewing from Babylonian times to the modern day, including a look at the actual brewing process in action. Naturally it finishes in the tasting room! Olveston – a snapshot of Victorian and Edwardian life. 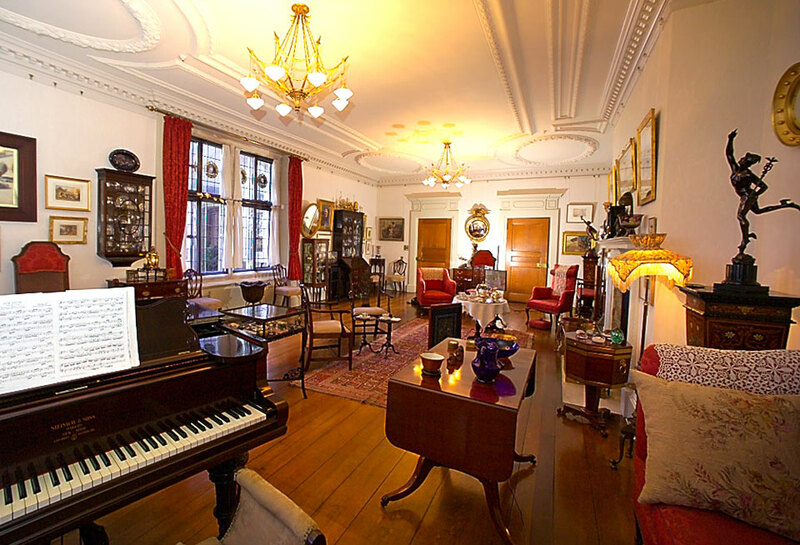 The Drawing Room at Olveston. You will be invited to play the piano. Olveston was the home of a pioneer merchant prince. The Theomin family built it in the early years of last century. They were a wealthy lot and travelled widely, collecting objects of desire as they went. After the parents died, their daughter, Dorothy, lived on in the house. It was never “modernised” and was indeed maintained exactly as it had been during her parent’s lifetime. Thus, when Dorothy Theomin died in 1966 and bequeathed it to the city we were left with this exquisitely detailed and accurate snapshot of life in Edwardian colonial New Zealand. That’s its real appeal – this is not a curated museum piece. The furniture isn’t the usual motley collection of whatever could be assembled to fit. The whole thing is a unique, unified whole. Everything in the place is actually what the family used in their everyday lives. 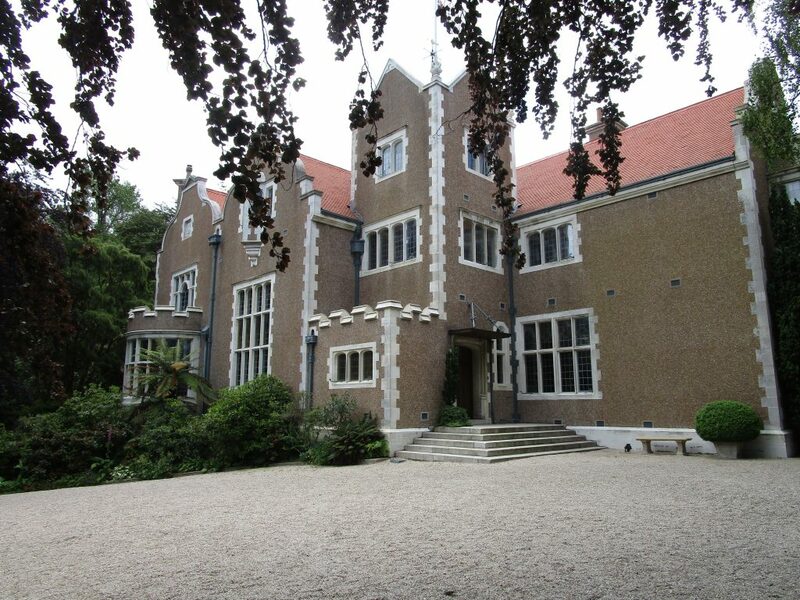 When I was there, the dinner table was set exactly as it was on the night that Sir Truby King was a dinner guest – a dinner at which he first suggested the formation of the Royal Society for the Protection of Women and Children, better known as the Plunket Society, the institution that to this day is the front line of paediatric care in this country. The name places were original. The silver and the china were the same – the very same – used that night. One could almost catch echoes of the discussion that must have ebbed and flowed back and forth on that momentous evening when one of the nation’s great social and medical institutions was being forged. Dunedin Botanic Gardens Opoho Rd Ph 03-477-4000. This was New Zealand’s first botanic garden with over 6,800 plant species and the birdsong of wild native bellbirds, wood pigeons and tui in the 28 hectare garden. For formal garden beds and flat paths visit the lower botanic garden. The information centre is open daily from 10am till 4pm and there is a cafe and winter garden glasshouse next door. A bridge across the river leads you uphill through pockets of bush to the more naturalistic upper garden. The Rhododendron Dell and Native Plant Collection are visitor favourites along with the aviary. Access to the garden is free of charge. Monarch Wildlife Cruises and Tours 20 Fryatt St Ph 03-477-4276 Email monarch@wildlife.co.nz. These guys have rightfully built a reputation as one of the best “eco” attractions in the country. On their harbour cruise you’ll get a great seaward-side look at the Albatross colony, as well as glimpses of all the other marine life around the region, especially penguins and seals. They can also take you on half or full day tours of the Otago Peninsular attractions. So now let’s head out on the peninsula road. Not hard to get there. From the city it’s well signposted. Glenfalloch Woodland Garden Portobello Rd. Glenfalloch, Gaelic for hidden glen, was first established in 1871. The 30 acre gardens are a Garden of National Significance. It’s worth a stop any time of year but at rhododendron time, it’s a must-see. New Zealand has a climate that is perfect for the beautiful rhodo. Indeed, but for the fact that the place is thousands of km from a source of stock in its native China, they would probably be the dominant local species. In two places in the country they are particularly resplendent – Mt Egmont in Taranaki and Otago. They start flowering in June and continue blooming until December, but in October they reach a glory peak. Larnach Castle 145 Camp Rd, Otago Peninsular Ph 03-476-1616 How about some history? Unlike many parts of the Old World, New Zealand doesn’t have a long suit in castles. Only one, in fact. A mad Member of Parliament, William Larnach, built Larnach’s Castle in the 1870s (pictured). It took 200 workmen five years to do the job – and that was before the advent of the 40-hour working week. It fell into disrepair, was used as an asylum for a while until the Barker family took it over many years ago. For a long time they laboured with little in the way of finance or assistance, but gradually the property was restored to its former grandeur and today it’s one of Dunedin’s top attractions. You can stay there too and dine in style in the castle dining room. The gardens are also worth the visit – they have been assessed by the NZ Garden Trust as a Garden of International Significance, the only one in the South Island. 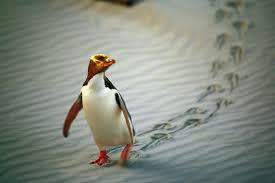 Penguin Place Harrington Point Rd, Otago Peninsular Ph 03-478-0286 Email info@penguinplace.co.nz. Yellow-eyed penguins (Maori “hoiho” – noise shouter), are the world’s most endangered penguin with numbers estimated at around 3000-4000. Introduced land mammals, the destruction of coastal forest for breeding habitat and public disturbance are the key reasons for the declining population. Unlike other penguins, the yellow-eyed does not gather together in large colonies and prefers the privacy of a secluded nest, traditionally in the cool and shade of a forest and as far inland as one kilometre. Being a non-migratory penguin they come ashore each day and at Penguin Place penguin viewing is guaranteed on every tour. Penguin Place operates 90 minute guided tours which are led on foot through a series of covered trenches and into viewing hides. These low-impact hides allow unique and undisturbed photographic opportunities year round. Small group tours of up to 15 people. Bookings essential. Royal Albatross. Lord of the Ocean Winds. 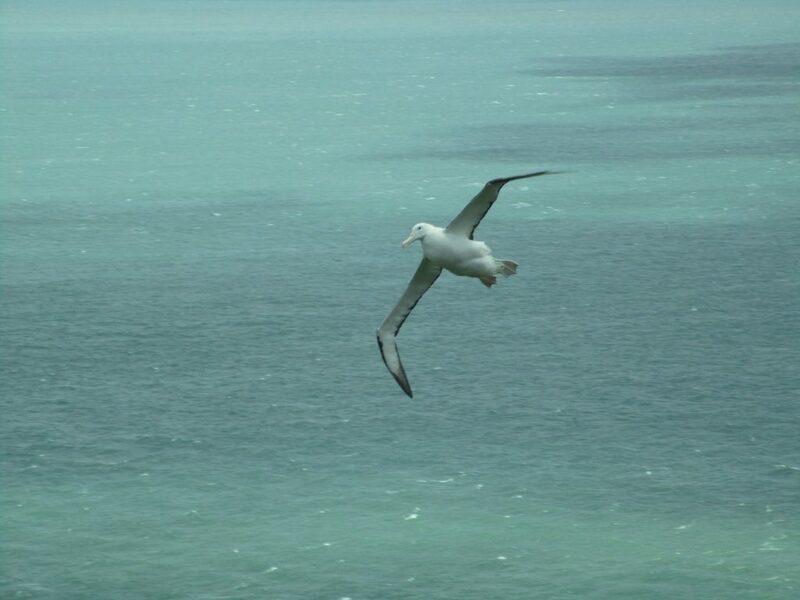 Royal Albatross Colony 1260 Harrington Pt Rd Otago Peninsular Ph 03-478-0499 Email reservations@albatross.org.nz. This ranks as one of NZ leading attractions. Nowhere else in the world can you take an easy car ride to visit an albatross colony. At Taiaroa Head, on the tip of Otago Peninsular, this lord of the ocean winds nests and breeds. The tours that visit there are a masterly blending of the needs of the environment and the desires of tourists. Unlike a lot of Disneylandish tourist attractions where nature is primed and prompted, pimped and preened to perform on cue, there are no guarantees about a visit to Taiaroa. You may be fortunate and see some awesome power flying from the largest seabird on earth, with its 3.3m (11ft) wingspan and capable of flying at 125kph. I had just that luck and got this photo of a bird flying so close to the lookout that our guide was able to name him by the colour of the rings on his leg. Or you may have no more than a chance to get within 50m of chicks waiting patiently for the return of their big-momma meal tickets. But that’s the luck of the draw in natural tourism. You don’t always get what you want, but at least it’s the real deal.